We are engaged in manufacturing and trading a wide range of products like pipe markers. 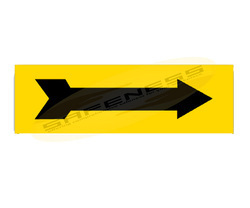 Usage: Used to show the direction of pipe or the direction of flow of fluid inside the pipe. all weather proof and come with 2 to 3 years warranty. 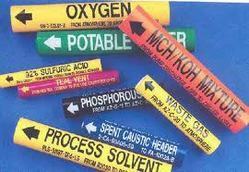 These markers are OSHA compliant and are colour coded to make work easy for your maintainance team. Pipe markers are labels on piping to help in the quick identification of pipe contents and flow direction. They are used to assist in the identification of hazardous materials being transported in piping systems and their hazards when released into the environment.